The Middle-East is being shaken up. The international illuminati/ Zionist/ Freemasonic/ Kabalistic/ Talmudic intrigue (here, here, here, here, here, here, here and here) want to rearrange the Middle-Eastern map. In near future, new countries will come into being and some current countries have to hand over parts of their territory and consequently will shrink considerably. This will however not take place without struggle or fierce resistant. The countries that have to hand over territory are Turkey, Iran, Syria, Iraq and Saudi- Arabia. These countries are well-aware of the plans of the international satanic intrigue and will resist against it with all their power. 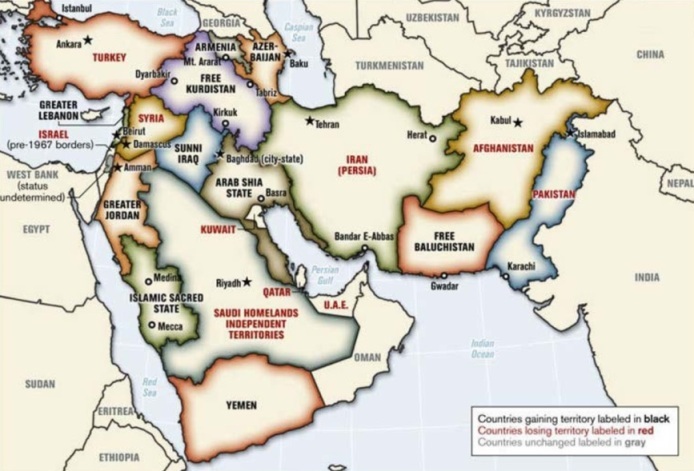 According to the stipulated plan of illumanatie/ Freemasonic Satanists from 2006, a new country will be carved out of Iran, Iraq, Turkey and Syria. This new country, that never existed, will be called "Free Kurdistan." It comprises the heartland of the indigenous Aramean nation. Syria and Iraq are weakened to the point that they are not able to resist. Turkey and Iran however are very strong and will definitely fiercely resist against handing over their territory in favor of establishing "Free Kurdistan". That is probably one of the reasons why Turkey is seeking rapprochement with Iran (here, here, here, here), despite their differences of eschatological view on Islam. With the current bloody war in southeastern Turkey between Turkish army and Kurds, Turkey wants to make clear that the establishment of "Free Koerdistan" will not be allowed and combated with all means possible (here, here). The Turkish government is planning to introduce a new law to strip "terrorist" lawmakers of immunity and the Turkish President calls to strip "terrorism supporters" of their Turkish citizenship. The Kurdish Regional Government of Mesud Barzani, in northern Iraq, fully supports the policy of Turkish government regarding the Kurdish matters. He is even so obedient that he identifies the Kurdish militia in Syria, the PYD, with PKK and therefore labels it as "terrorist." On 17-3-2016 various Kurdish groups in Syria declared the establishment of federal region in northern Syria. To make the world used to the idea of "Free Kurdsitan", from time to time some information trickles through in the media. Sputnik News reported on 29-11-2015 in an article entitled " Emergence of Independent Kurdistan Just a Matter of Time - Czech President ": "The emergence of an independent Kurdistan is only a matter of time, President of the Czech Republic Milos Zeman said....."
The Times of Israel reported on 20-1-2016 in an article entitled " Justice minister calls for an independent Kurdistan ": " We must openly call for the establishment of a Kurdish state that separates Iran from Turkey, ............."
The question is of course "when"? As stated previously, under current circumstances Iran and Turkey will not cooperate in the establishment of "Free Kurdistan." It is also unlikely that they will surrender to the heavy pressure from Russia and United States. This means that both countries in the future should be weakened to such extent that they cannot resist anymore against the establishment of "Free Kurdistan." In this prophecy we read that amongst others Iran (Persia), Turkey (Beth Togarma) and other countries are involved with this immense war (38:4-6). This gigantic army, under leadership of Gog from Magog, is completely destroyed by the intervention of the Lord God Yahweh. Turkey and Iran will militarily be defeated. After the defeat of Turkey, most probably the country will be dismantled and the establishment of "Fee Kurdistan" will be made possible. Iran is than weakened to such extent that it cannot resist anymore. The question is: Who or what is Gog/ Magog? There are various views about the identity of Gog from the land Magog, the chief prince of Meshech and Tubal. A particular theory that is being embraced by the Baptist / Evangelical and other Protestant groups is the identification of "Gog from Magog" with Russia. This popular theory was introduced by the controversial Scofield Reference Bible and is today used by many Christians as "standard Bible." In the Scofield Reference Bible we read in Ezekiel 38:2 about Gog and Magog: "Gog: That the primary reference is to the northern (European) powers, headed up by Russia, all agree. ......... "gog" is the prince, "Magog," his land "
" The reference to Meshech and Tubal (Moscow and Tobolsk) is a clear mark of identification. Texe Marss says about Socfield: " Cyrus I. Scofield and his heretical "Bible" continue today to be idolized by Southern Baptist leaders, Pentecostal and charismatic teachers, and millions of deceived evangelicals.......... "
Henry Makow says about Scofield: "Cyrus Scofield (1843-1921) was an Illuminati agent whose 1909 annotated Bible duped countless evangelicals into unconditional support of Zionism"
"Scofield is an example of how the Illuminati can amend or interpret the Bible to advance their agenda of world tyranny"
The former Palestinian terrorist Walid Shoebat, now a passionate Christian, published on his website a pioneering analysis in which he refutes with strong arguments the identification of "Gog and Magog" with Russia. He demonstrates that Gog and Magog do not refer to Russia but to Turkey and Caucasian Islamic (Turkish speaking) republics. Regarding the well-known, authoritative reference books and Atlases, he says: "But when we examine some of the greatest biblical reference manuals, like the Macmillan Bible Atlas, Oxford Bible Atlas, The Schaff-Herzog Encyclopedia of Religious Knowledge, The Moody Atlas of Bible Lands, The Zondervan Illustrated Bible Dictionary, the IVP Bible Background Commentary, The New Unger’s Bible Dictionary, The Catholic Encyclopedia and The Matthew Henry Complete Commentary; they all locate Magog, Meshech, Tubal, Gomer and Beth Togarmah in Asia Minor or in the landmass between ancient Armenia and Media (1)—in short, the Republics south of Russia and north of Israel, comprised of Turkey, Uzbekistan, Kazakhstan, Turkmenistan, Azerbaijan, Turkestan, Chechnya, etc. but all these are all Muslim nations"
On the source of wrong interpretation of "Magog= Russia" he writes: "The error of the “Magog is Russia” theory arose from the Scofield Study Bible, which identifies Mesheck and Tubal with the modern Russian cities of Moscow and Tobolsk later to be popularized by Tim LaHaye and Hal Lindsey’s Late Great Planet Earth. " According to Shoebat is the identification of Meshech/ Moscow and Tubal/ Tubolsk nothing else than play on words and says: "Gog, .... is of the land of Magog, a very specific place, and he is the ruler, “chief prince” of his domain called “Meshech and Tubal” which are the ancient Moschi/Mushki and Tubalu/Tibareni peoples who dwelled in the area around, primarily south of, the Black and Caspian Seas....... "
Another important point is that in many modern translations of the Bible, Ezekiel 38 verse 6 and 15 is talking about "far north" in relation to Israel. With that, Gog/Magog is identified with Russia. The authoritative English King James translation from 1611 translates Ezekiel 38 verse 6 and 15 as "north quarters" and "north parts." 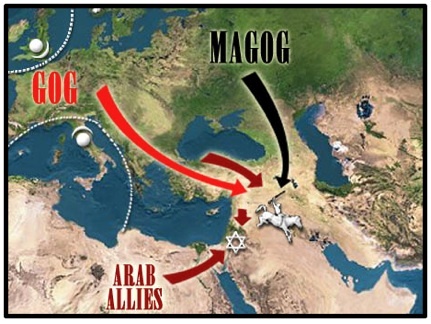 World Net daily published on 21-6-2012 a detailed analysis entitled " The truth about Gog and Magog " in which the erroneous of "Magog= Russia" is exposed. Based on number of popular prophecy maps and maps from the renowned Bible atlases, composed by experienced Bible scientists, the wrong idea of "Magog= Russia" is refuted. It becomes clear that Magog, Tubal, Meschek are all situated in Turkey and not in Russia as promoted by Scofield Reference Bible and today still is embraced by millions Christians. In the analysis of World Net Daily (WND), a pertinent question is being asked: "Why is there such a radical discrepancy between Magog’s identification according to popular belief, and these various scholarly resources? Are the atlases and the many conservative scholars that created them all wrong? Or are the prophecy teachers wrong? How have the two groups arrived at such different conclusions?" The radical discrepancy is explained as follows: "The answer lies in the different methods of interpretation used by these two groups. Most conservative, trained scholars of the Bible use what is called the historical-grammatical method of interpretation. This is to say that they simply identify the names found within Ezekiel’s prophecy according to how Ezekiel himself would have understood them. Thus in the late seventh and early sixth century B.C. when Ezekiel prophesied, Magog, Meshech and Tubal were known to have dwelt in Asia Minor, or modern-day Turkey"
Another example of Scofield Bible based map in which Magog is situated in Russia (Source). 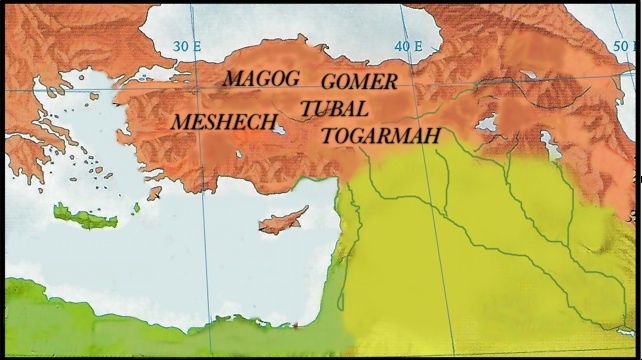 Magog, Tubal, Gomer and Meschech are situated in Turkey. The Holman Bible Atlas (Source). Another method of identification of geography is called "bloodline-migration method". "This method of interpreting the names within prophecy attempt to trace the bloodlines, intermarrying and migration of the ancient peoples mentioned within a prophecy to link them to their modern-day descendants and the nations where they now live. But this method is fraught with problems, variables and inconsistencies. When using this method, five different teachers will, and usually do, arrive at five different conclusions. None uses this method consistently, with each interpreter stopping at random periods of history, whenever it may suits his view and provide the result desired. Because there is such an abundance of data out there, and a few millennia between the ancient prophecies and modern times, the data are easy to manipulate and mold to one’s own prophetic bias." The publication of WND unfortunately "forgets" to mention the source of this error and the enormous million dollars propaganda by Freemasonic / Kabalistic/ Talmudic/ Zionist illuminati to promote the Scofield Bible. The international satanic cabal will help Turkey to become very powerful nation to make the prophecy of Ezekiel 38/39 possible to be fulfilled. And indeed, Turkey becomes more and more powerful by the day. The country is presenting itself as the protector of the Muslims everywhere in the world (here, here, here). From Caucasus to Balkan, Middle-east/ North - Africa to Sudan and Somalia, Turkey presents itself as the shepherd of the Muslims. The disobedient nations in these regions, such as Balkan and North Africa, will be conquered and subdued. Needless to say however, but the Turks/ Gog/ Magog and their hordes will cause horrific bloodbaths among the nations who refuse obedience. This will result in immense fear and respect for Turkey and their hordes. In the Islamic world, Turkey/ Gog/ Magog will be embraced as "liberator and defender" of Muslims against the "infidels." At the peak of her power, Turkey/ Gog/ Magog will have gained unprecedented prestige that she will be able to mobilize a gigantic army (38:4-6, 9, 15) together with Iran to "liberate" Jerusalem. If indeed the idea that Gog/Magog= Turkey is correct, then it will be destroyed by Russia and/or Israel using nuclear weapons. After that, Turkey will most probably be dismantled. Iran is then defeated as well through which she will not be able to resist the establishment of never existed "Free Kurdistan" in the heart of the Aramean indigenous lands. It is possible that the defeat of Gog/ Magog/ Turkey and her allies will be claimed by antichrist causing the apostate part of Israel to accept him as their "true Messiah." Perhaps this will result in the covenant of Daniel 9:27. On the Aramean genocide of 1915, the archpriest Sleman Henno writes: "Dear reader, I have explained to you the reasons for the mass killings, and the way they were carried out. Come with me to visit all the regions where the mass killings took place, to see what these two peoples, the Turks and Kurds – who are notorious because of their horror, maliciousness and lack of compassion-, the massacres they have caused and innocent blood they have shed. These areas of Anatolia till the borders of Ottoman Empire, thus till to Persia and Russia, were inhabited by many Christens. We will encounter tragedies and bloodshed which has no equal. From the Creation of the world until know; no body have seen such a thing: Children, women’s and elders were stabbed to death and infants were taken from the womb of their mother and smashed against the walls. What a horrible unbearable fate. Something like this even was not managed by the godless Djengis Khan neither by the Ta- Mongolian Hüläga and Timur Lenk. Even in the times of heathenism is about such a thing never noticed. Not a tong, not a pen can describe such a thing. The tears wells out of our eyes and stream over the cheeks. Complete cities were robbed of Christians as if there never any Christian have had lived. In many villages, there was even nothing left which could be remembered to the Christians." The Turks and Kurds are invaders in the Aramean indigenous lands. Both peoples avail themselves of wars, bloodbaths, persecution, suppression, intimidation, destruction, plundering and confiscation of the properties of others. They are very suspicious and will only accept you if you take obedient position. You have to accept the life of a slave, before they accept you. After exterminating the indigenous Aramean nation, now both peoples are involved in a bloody struggle on the ownership of the Aramean indigenous land. You should not badger and bother them about equality, rights, honesty, cooperation, goodness and mutual respect. They do not understand these noble values; it is not their way of life. The criterion is persecution, submission and unconditional obedience. The exception of the rule is when they are in a weak position or minority. 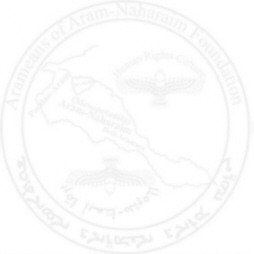 The ceaseless confiscation and harassments of the Arameo- Assyrians and Arameo- Chaldeans in northern Iraq by the Kurds is only too obvious example of how the Kurds rob, terrorize and plunder others. The Turks and Kurds have together exterminated the indigenous Aramean nation, confiscated their indigenous lands, appropriated their girls and women, killed their sons and men and raised the children as Muslims (Kurds/ Turks). If the Freemasonic / illuminati/ kabalistic Satanists manage to establish "Free Kurdistan", it will be disastrous to the Aramean (fake: Assyrian) nation. The remaining Arameans, left over from the centuries old extermination policy of the Turks, will completely be exterminated. Some people do not understand anything of why Europe and United States do not take any action against Turkey regarding flagrant violation of human rights, restriction of freedom of press, persecution/ harassments of journalists and putting them in jail, conduct a bloody war against the Kurds and label everyone as "traitor" or "spy" who dares to criticize the policy of government. There are various reasons for this silent. Below, we mention two of them. 1) As told before, Turkey will be made very powerful by the international satanic intrigue to fulfill the prophecy of Ezekiel 38/39. Hence, the current government is allowed everything to do no matter the seriousness or the damage they cause. And that is also the reason of the Western silent. One ponders beloved reader whether current Turkish rulers wittingly are cooperating with the international illuminati/ Freemasonic satanic intrigue to carry out the prophecy of Ezekiel 38/39 or that they have been blinded by the illuminati Satanists to such extent that they are unaware of what is happening to them. 2) The illuminati / Freemasonic/Kabalistic/ Zionist intrigue want to use the war against the Kurds to attribute them the position of "victim" caused by "Turkish aggression." After the war of Ezekiel 38/39, the Kabbalistic/ Zionist/ Freemasonic Illuminati will say: "The Kurds have suffered so much under the aggression of the Turks, now they deserve their own country." That the Kurds and Turks have exterminated the Arameans (fake: Assyrians) and Armenians is totally not relevant to the illuminati/ Freemasonic Satanists. On the contrary, shedding of millions liters of Aramean and Armenian Christian blood was a delicious and tasteful sacrifice to the god of Freemasonic/ Illuminati Satanists, Lucifer/ Satan (here and here). What we see is that after the punishment of Israel and their repentance, the Lord God Yahweh turns back to the peoples He had used to discipline Israel and executes heavy judgments and in some cases even exterminated them completely. Another example of rod of discipline in the hands of the Lord God Yahweh, were the ancient Assyrians. In Isaiah 10:5-7 we read: "Woe to Assyria, the rod of My anger— the staff in their hands is My wrath. 6 I will send him against a godless nation; I will command him to go against a people destined for My rage, to take spoils, to plunder, and to trample them down like clay in the streets. 7 But this is not what he intends; this is not what he plans. It is his intent to destroy and to cut off many nations." In other words: Assur is used as rod of anger to discipline Israel and after that He deals with Assur. The government of God on earth does not distinguish between Jews and non- Jews when dealing with punishment and blessing. Unfortunately, the Aramean (fake: Assyrian) nation did not understand anything from these serious warnings, causing the Holy Heavenly Father to allow hostile peoples trample, plunder and terrorize them. Therefore, we are convinced that the Turks and Kurds were used as rod of His anger to discipline our people (here, here, here, here). The Aramean people have completely removed the Lord God and His beloved Son Yesuh M'siho from their lives and have chosen for the path of disobedient (here and here). The Holy Heavenly Father have used these two peoples, the Kurds and Turks, who are notorious because of their horror, maliciousness and lack of compassion, to discipline our nation so that they would repent and stop with their evilness and go back to the Lord God Yahweh. Unfortunately they are very stubborn, deaf and blind and do not want to know anything about it. Finally they forced, with their evildoings, the Lord God Yahweh to send them in Diaspora causing them to sojourn at other mans doors. The Turks and the Kurds had unfortunately something else in their mind than to allow themselves to be used by the Lord God Yahweh as rod of punishment in His hands to discipline the Aramean (fake: Assyrian) indigenous nation. What these two nations wanted was the complete extermination of the Aramean nation. This was however not the intention of the Lord God Yahweh. Yes, they had to be punished severely, but not in de way the Turks and Kurds have done. The consequence of this is that the Lord God Yahweh will turn back to the Turks and Kurds and will deal with them, because: "And I am very sore displeased with the heathen that are at ease: for I was but a little displeased, and they helped forward the affliction....."
These two nations have no slightest idea of what kind of judgment is in store for them. The problem with the mentality of these people is this: They are used to plunder, terrorize, exploit, chase away, exterminate and appropriating the properties of others. Because this kind of mentality has proved to be rewarding during the past centuries, they have no reason to change or improve themselves. They are very proud of themselves through which they have been completely blinded and hence do not understand why they should change. Needless to say beloved reader, but the mentality of the Kurds and Turks has been heavily molded by the Islam. Christianity is not practical in terms of plundering, exploiting, terrorizing, subduing and appropriating. In the eight century some Turkish tribes were converted to the Christianity by the Aramean (fake: Assyrian) missionaries. In Part II of Hidden Pearl on page 196 we read about the East- Aramean Patriarch Timothy I: "The key figure of the Eight- Century Persian Church was their extraordinary Patriarch Timothy I, who was not only a fine scholar of gentle temperament whose defense of the Christian faith earned him the respect of the Abbasid caliph with whom he debated, but who was also passionate supporter of Christian evangelism. 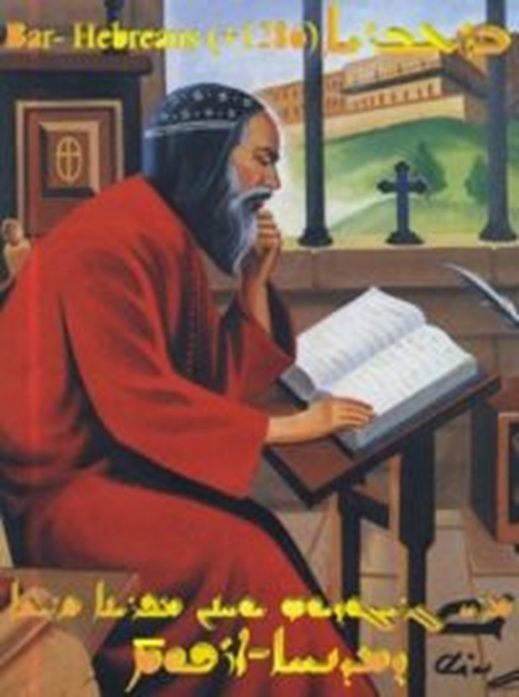 In 781 Timothy could write to a Maronite correspondent that: the king of the Turks, with nearly all (the inhabitants of) his country, has left his ancient idolatry and has become Christian, and he has requested us in his letters to create Metropolitan for his country, and this we have done." As previously explained, the judgment of the Turks will most probably be executed during the war of Ezekiel 38/39. After that the "Free Kurdistan" will be established. Because the Kurds are so divided in different clans, groups and all with completely different mentality and way of life, the new established "Free Kurdistan" will not function properly on political, social and cultural level. For example: The clan of Barzani considers itself as superior and will never bow down for other clans. At this moment they have to fight against an enemy, therefore they seem to be a solid and well-organized group. This is however just appearance for the time being. After the establishment of "Free Kurdsitan", it will become crystal clear that the country simply will not function. We believe beloved reader that after the establishment of "Free Kurdistan" the judgment of the Kurds will be executed. Why after and not before the establishment of "Free Kurdistan"? Well, when two countries are at war with one another, the strong country can completely destroy the weak one. The situation becomes a bit more complex when the war is between a country and a people within its territory. The international law demands a country to protect its minorities. Therefore, in the current situation the judgment cannot be executed over millions of Kurds; only after the establishment of "Free Kurdistan". Another point is of course, although to less extent compared to Kurds and Turks, is the terror against - and extermination of the Aramean indigenous cultural identity by Pseudo- Arabs. We call them "Pseudo- Arabs" (here, here), because the overwhelming majority among them are originally Arameans. 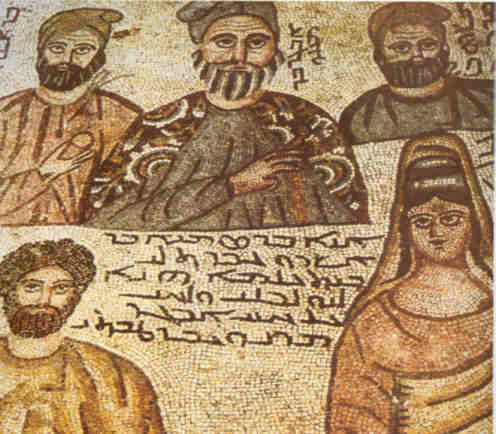 After their conversion to Islam, they abandoned Aramaic and implemented a dialect of Aramaic called "Arabic" and hence are called "Arabs." They are linguistic Arabs, not ethnical! The driving powers behind the nationalistic Arab movement were United Kingdom and France. In addition to Turks and Kurds, the Arab nationalism has stroked heavy blow to the Aramean cultural identity. The so-called "Arab" nationalism is combating the Aramean identity with fire and sword. To them, everything is "Arab" while in reality nothing is Arab, but everything is Aramean. United Kingdom and France are the two most evil colonial countries on the face of the earth if we carefully investigate their cruel and carnivorous colonial activities. In addition to "Arabism", these two most wicked colonial powers have also invented and promoted "Assyrianism" to exterminate the Aramean indigenous nation. "Arabism" and "Assyrianism" are two unholy colonial products that are soaked with lie, deceit, backwardness, historical distortions, oppression and tyranny. In conclusion, let we hope and pray that many Kurds, "Arabs" and Turks will accept Yesuh M'siho as their Lord and Savior to escape the coming horrific judgment. May the Holy Heavenly Father choose and motivate men and women from the Kurds, "Arabs" and Turks to stand up and serve as candle to shine the light of Yesuh M'siho in the hearts of these populations. Amen.